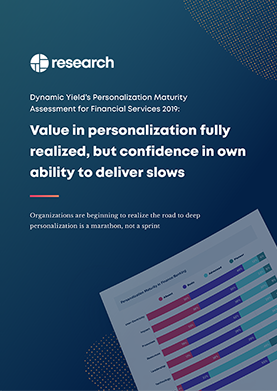 To understand the current state of personalization maturity, every year, Dynamic Yield surveys marketers and executives from cross-functional roles within the financial services industry in AMER, EMEA, and APAC to better understand the degree to which companies feel as though they are personalizing experiences for customers. This report includes the responses of over 100 participants from 2018-19, allowing us to not only provide updated benchmarks but also compare between last year’s results. Culturally, organizations share a greater belief in the value of personalization than ever before, recognizing the long terms benefits associated with tailoring their outreach. Leadership-wise, more organizations see personalization as a top priority and plan to continue investing in their programs, but most still have to make a business case for resources. The level of personalization maturity has gone down from Advanced to Basic within finance as companies realize their own gaps and barriers impacting output. Across the board, ad hoc processes are used to serve in-the-moment-needs instead of instituting dedicated teams for personalization. Access to data remains a big problem for all, with organizations yearning for more when it comes to making informed, data-driven decisions. While there’s much ado about personalization technology, it’s gotten farther away from acting as a core piece of the marketing stack.